Mary Jo Knudsen, 89, passed away on June 10, 2018 at Heart of the Rockies Regional Medical Center in Salida, Colorado. She was born in St. Joseph, Missouri on October 27, 1928 to Andrew Rome and Edna Mae (Meyer) Pringle. Mary Jo graduated from Salida High School in 1948. After high school she went to work for Mountain Bell as a telephone operator. That was when the operator would ask, “Number Please”. On June 19, 1949 Mary Jo was united in marriage to Norman Stevid Knudsen in Salida, Colorado while Norman was in the Navy. Mary Jo joined Norman in Norfolk Virginia, where she worked in the telephone office. After Norman was Honorably Discharged from the Navy they moved back to Chaffee County where they lived for over 30 years. 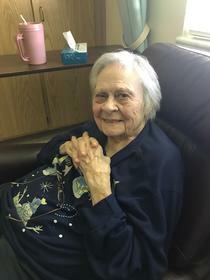 Mary Jo enjoyed working with puzzles and being a grandmother to her grandchildren. Mary Jo was preceded in death by her husband; her parents; and brother Andrew “Junior” Pringle; sister Peggy Jean (Pringle) O’Barr; daughter Debbie Sue Knudsen; and great-great grandson Walker Compton. She is survived by her children Jerry (Maurie) Knudsen, Judy (Garry) Blossom, Carol (Jim) Adams, and Jeanette (Jeff) Stephens; 8 grandchildren and 18 great grandchildren; 3 great-great grandchildren; many nieces and nephews and friends. A funeral service will be held at 10:00 AM on Monday June 18, 2018 at Lewis & Glenn Funeral Home in Salida, Colorado. Interment will follow at Fairview Cemetery. In lieu of flowers, memorial contributions in Mary Jo’s honor may be made to the Special Olympics or Easter Seals. Arrangements were with Lewis and Glenn Funeral Home in Salida. Online condolences may be offered to the family at www.lewisandglenn.com.